He failed to birdie the par 5 and bogeyed his last to fall away at 250/300/1. Now, the stakes were only a tenner EW but it would have been nice. But I'm already over it - Given I'm one of the most negative people you'll ever meet, anything less than a bogey on the last for my guys in contention is a bonus. 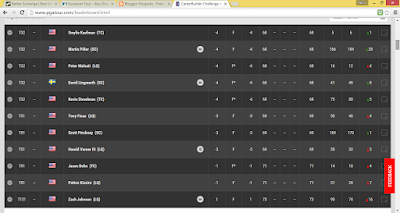 I've now recouped 80% of my stake trading back Kaymer. I decided I don't like the way the leaderboard is looking and his late tee time so as mentioned on the Twitter yesterday, I placed some of that quan on little Matt Fitz who likes fairways (very penal rough here this week) and he didn't have a bogey yesterday. Matt has just posted -1 for a -5 total as I write so there will be somewhere around 50% loss on that too. I could slap Zach Johnson with a wet fish right now. I really did feel I was having an early round trade to nothing with this one so I added a ton to my Career Builder Challenge book on the Open champion. He bombed. Maybe he'll shoot -10 in R2 and I can get my stake back. Currently I have a load of players and darts in or around the -3/4 position which is 4 shots back. Now, I havn't yet seen the scoring averages but it seems the Stadium Course played the toughest and a lot of mine played that yesterday. Indeed it looks like only 4 from the SC broke the top 30 yesterday. 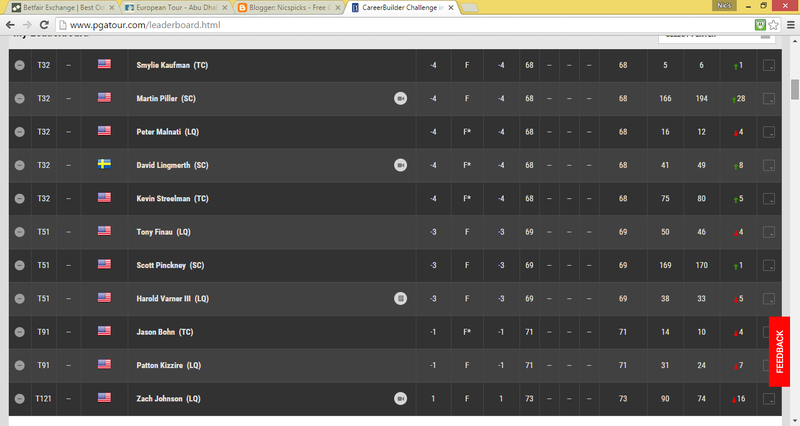 I would so like Martin Piller to break the top 20 this week. I mentioned he was priced between 5s and 28s for a top 20 across the books so in other words most were pretty clueless there on his chances. Harold Varner III, Finau and Lingmerth are the main trades so hopefully 1 or 2 of them can go low later to give me a decent trading position after round 2. Given the course rotation, I may let a decent bit ride if thigs go well today. Back to Abu dhabi now and a Paratore top 20 would be nice so a low 1 this afternoon is needed. Morrison will start level while Bjerregaard, in hindsight regardless of score, doesn't look a great selection and is in danger of a MC.